This weekend I did something wrong. I got a Fatburger without any alcohol in my system. Apparently, at least according to the all the rappers, this is a must to truly enjoy a Fatburger. Why didn’t I? True, I was in Atlantic City at the Borgata where the drinks flow aplenty 24/7, but it was noon and I was planning to hit the gym afterwards (of course, that didn’t happen). In any case, I ordered a Baby Fat (small; $3.09) with The Works (mustard, mayo, pickles, relish, lettuce, tomatoes, and onions), cheese ($.99 extra), and a fried egg ($.99 extra). If I’d been drunk, I probably wouldn’t have noticed the bread, although toasted, was stale, and the cheese was barely melted. Nevertheless, the burger was made-to-order, and the patty had a really impressive crust. 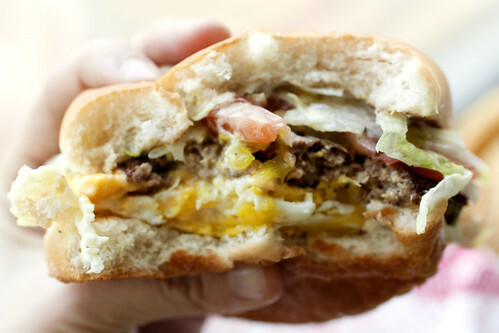 (Fatburger smashes the patties on a griddle by default, but “on-the-char” is also an option.) I also liked how the taste of the mustard came through even with all the other toppings going on. Having the option to add an egg was great too, but a runny egg would have been nicer. 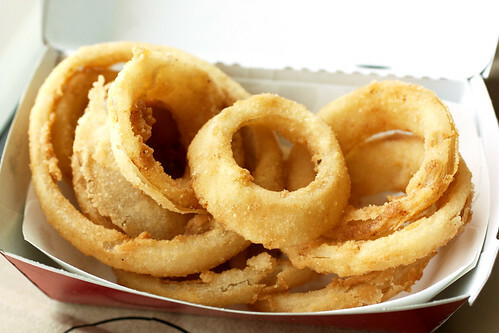 A side of onion rings ($3.39), although a bit pale (C’mon, this is Jerz, orange is in! ), fared better with thick slices of onion, and a crunchy fried exterior that didn’t slip off after one bite. Overall, I liked Fatburger, but it could have been better. Next time, I’ll do it right like Ice Cube, and get a Fatburger at “two in the morning” after a “sip of the potion.” The Fatburger at the Borgata closes at 5:30am. Fatburger Yes!! Had them at Las Vegas a few times. Too bad I did not try In N Out. let me get this straight… you went to a casino… you were about to have lunch… and then you held yourself back because you were going to go to the gym at the casino? @Someguy – OMG, you must eat an In-N-Out next time! @Danny – You’ll be happy to know I didn’t go to the gym because they were charging a usage fee and later went to the casino and got my drink on!